Regina was born in Chicago, Illinois. 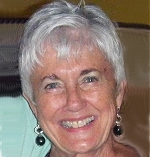 She graduated from Bradley University, Peoria, Illinois 1970 and then taught English for less than a year. She was the Human Resources Manager for May Dept. Stores, St. Louis and Federated Dept. Stores in Florida before moving to Mexico in 1987. She moved to Cuenca, Ecuador in 2010. You can reach Regina by email. After 23 years of living at Lake Chapala in Mexico, I decided to strike out and explore where I might want to live next. I was already familiar with Spanish-language countries; I had lived a happy, interesting, and contented life in Mexico since I was 40 years old. However, after 25 years as a single female expat, it was time to move on. As more and more baby boomers looked to Mexico as their retirement haven, too many gringos moved into my little pueblo. When a Walmart and a casino were proposed and then built, I knew it was time for me to go. I spent two winters exploring Nicaragua, Costa Rica, Panama and Ecuador. I chose Cuenca, Ecuador. Why Ecuador? Of all the places I researched when thinking about making a change in my life, this is the country that appealed to me the most. I looked forward to the opportunity to live in an urban setting after so many years of living in a small town. Cuenca offers many opportunities to dine out, attend cultural events, take part in expat gatherings and organizations, and explore a small but diverse country on very little money. There are book clubs, a bridge club, a community theater, humane societies, and many more special interest groups if one is interested in joining. Since the country is about as large as the state of Nevada, it’s possible and affordable to travel and get to know all parts of the nation. The biodiversity is as staggering as the scenery. Some of the greatest natural gems in the world including the Amazon, the Andes, the Galapagos Islands, cloud forests, volcanoes, and more than 600 species of birds can be found in Ecuador. I never lack for interesting options for sightseeing: colonial cities, lakes, ruins, hot springs, waterfalls, national parks, cobblestone streets, town squares, handicrafts, and traditional celebrations. If one is adventurous, there is a whole country to explore as well as the neighboring South American countries. My living costs are surprisingly affordable. I find it costs less than Mexico or the US for everything from utilities, groceries, dining out, nightlife, cultural events, and transportation. I pay less than $500 a month for a large apartment including utilities, internet, cable TV, and weekly maid. When I sought medical attention (gastroenterologist, dentist, dermatologist, and ophthalmologist), the costs were very low. I even opted for the dreaded colonoscopy and endoscopy this year for under $500 for both procedures. I don’t even own a car anymore, so I have no auto maintenance headaches, gasoline costs, nor license and insurance expenses. Of course there are pros and cons to living in any foreign country. Many find that being so far away from family and friends is intolerable. In my case, I find airfare back to the U.S. is costly, as are imported food, and health and beauty items. I am learning to substitute more affordable local products. Weather is a big factor of living in Ecuador. Some may not like the cooler temperatures at higher elevations. We have sunny days but cool nights in Cuenca. The coastal areas on the Pacific Ocean may appeal more to those who don’t like the sound of that. I feel I have a superior lifestyle here with plenty of exercise (most of us do not own cars) and fresh foods in my diet. It’s rare that a week goes by without an invitation to dinner, a movie, or a party. For me as a single woman, it is not the lonely life that some singles lead. I have met more new friends in the short time I’ve been here than I was meeting the past few years of my time in Mexico. Many very interesting people are visiting Ecuador to see if it might be their retirement destination and many more have already made the decision to relocate here. Since tourists are only given a 90-day visa to visit Ecuador, you may wonder what was required to obtain residency so I can live here on a permanent basis. After proof of sufficient income or pension is shown, getting the visa is a one-time proposition. Besides giving me permission to live in Ecuador for the rest of my days, residency provides pensioners with discounts and refund of the 12% sales tax in addition to preferential treatment when waiting in line at banks, government offices. While it might not be the right decision for others, I’m still glad that I took the plunge to try out life in another country. Click for other information about Ecuador. Hola. I lived in lake chapala & guadalajara for years. I will make my visit to cuenca in july & aug. Have a good day. Thanks for this, Regina. I have been actively internet researching Ecuador, especially Cuenca, and it is great to hear a single woman’s viewpoint. Hope to come see the city in person in October. I have lived in Zihuatanejo for 43 years and it’s time for a change. However, I am a bridge player and need a infusion a coupled times a week. Can you tell me what the ridge community is like? It is now 2015 and this all was posted in 2014, what is it like now for a single female. The same? I visited Quito on my way to the Galapagos islands in July and I simply love the people and all that the country has to offer. It is good to know that single women are welcome and comfortable in Cuenca. I am planning on another trip in November, yoga retreat, before making my final decision to retire permanently in Ecuador by August 2016! Between Costa Rica, Panama and Ecuador, I choose Ecuador. Thank you for the insight and great information. We are in Cuenca for three nights. If there is a duplicate bridge game the next couple days or nights please reply with times and location. I am 57 , single and going to Costa Rica this year for 3 months to see what life is like . I hope to move there permanently in the near future . I’ll be staying in Heredia , any good advice ? Thankx ! i am a single 54 yo female in 2016. I have been researching EC for a year and will be coming alone. I wonder if there are any folks in the more southern regions, like Lojas, or even in Northern Peru, who are willing to share their experiences. I am working on getting my disability pension and improving my high school spanish in the meanwhile. Any suggestions for areas to check out, what to avoid, etc.? I’m happy to share info with you about expat life in Cuenca. Please write again or Private Message me. I am a 62 year old female whose 36 year marriage is ending officially in June. Once all is settled and affairs in order I believe that I have decided that Cuenca may be the place I wish to settle. I am now in the Northeast US. I will be alone and just wanted any insight you may have in general and concerning safety for a single woman. I am also looking at Chapala Mexico. Thanks. I was in Ecuador some years ago and loved it. I’m searching for a cheaper place to live and Cuenca sounds ideal. I’d also like to check out some other towns, so will be traveling a bit. You make it sound living in Cuenca really great. I was in Ecuador many years ago and found it very impressive.I will return soon (probably February) to check it out as a place to spend my ever declining years. Bob, I’m still living in Cuenca years after I wrote this entry. If you want to meet when you again visit Ecuador, contact me at azuay65@gmail.com or Facebook.